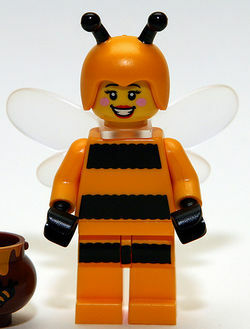 Bumblebee Girl is a 71001 Minifigures Series 10 minifigure released in May 2013. Bumblebee Girl has yellow-orange legs, a yellow-orange waist, a yellow-orange torso, yellow-orange arms, and black hands. There are two large, black, fuzzy, horizontal stripes on the front of her torso and one stripe on the upper part of her leg piece. These stripes help give her body the general appearance of a bee's. Attached between her torso and headpiece is a wing piece, which is the same piece as the one previously used by the Fairy from Minifigures Series 8. She has a yellow-coloured head with black eyes, white pupils, black eyelashes, and a smiling mouth with red lips. Pink printing also gives her the appearance of rosy cheeks. She wears a yellow-orange hairpiece with two black antennae, further giving her the appearance of a bee. She comes with a honey pot that uses the same mould as the Leprechaun's pot of gold, but one side of Bumblebee Girl's pot is printed with honey dripping out on the side and an image of a bee further down. She is the seventh minifigure in an animal costume, the others being the Gorilla Suit Guy, the Lizard Man, the Bunny Suit Guy, Chicken Suit Guy, Panda Suit Guy and the Piggy Guy. She is also the first girl in an animal costume.